Kevin is a native Oregonian who enjoys a strong cup of coffee. He started drinking coffee as an undergraduate at George Fox University. A coffee shop opened near the university during his junior year. It became a popular place to hang out. Kevin spent a lot of time at the coffee shop. He ended up marrying one of the baristas. Kevin earned a BA degree in Communication Arts at George Fox University. He worked in the admissions office of his alma mater for four years before venturing to graduate school in sociology at Purdue University. He earned his PhD in 2003. After teaching for several years at Calvin College in Michigan, Kevin joined the faculty at Baylor in 2005. Moving to Texas was a big adventure for Kevin and his family. They had never experienced weeks of 100-degree heat or fire ants. They quickly adapted. 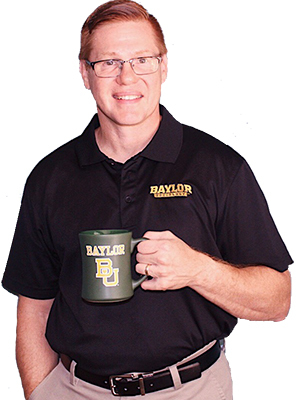 Kevin’s research and teaching have flourished at Baylor. Religious organizations are his research specialty. He has written on religious leadership, religious affiliation, racial diversity in congregations, congregational growth and decline, religious higher education, and the impact of religion on other realms of social life. His research appears in leading academic journals and major news outlets such as CNN, National Public Radio, and USA Today. Research and teaching are equally important to Kevin. He serves as Graduate Program Director in the Department of Sociology. He leads graduate seminars on professional development, religious organizations, and teaching. He is passionate about helping students become successful scholars and teachers. Strong coffee continues to play a prominent role in Kevin’s life. The smell of coffee greets Kevin, his wife, and three daughters each morning. His family loves to travel. They recently returned from a trip to Costa Rica, where they had café con leche at every meal. Kevin would be happy to tell you about it over a cup of coffee sometime.